Get 0% interest financing for 60 months on your new Hot Spring spa purchase! Click here to apply and see if you qualify for Wells Fargo financing during this very special program. Talk to one of our Hot Tub Experts about the details, and find out how affordable a new hot tub can be. 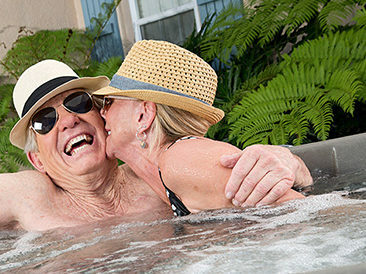 Having your very own hot tub gives you 24/7 access to personal hydro-therapy and hydro-massage. The heat in a hot tub raises your body temperature to increase circulation, and the buoyancy reduces your body weight, relieving pressure on muscles and joints. A hot tub is an amazing investment in wellness for your body, mind and spirit. Depending on the spa model you choose, your monthly spa payment may be less than your cable bill. Wondering whether you’ll get enough use out of it to justify the purchase? Many of our hot tub owners soak daily. It becomes a lifestyle change, because the benefits they experience are undeniable. Looking for the perfect spa? Could Hot Tub Financing work for you and your family? Let’s find out what’s possible. The wellness benefits are incredibly rewarding! Use this handy checklist to organize your thoughts as you do your hot tub research. Get clear about what’s important to you and your family, and easily compare different hot tub models, brands and features.